Description: Extremely long outer tail feathers, white with black tips; deeply forked tail is often spread in flight. Male’s tail is longer than female’s. Pearl gray head, back, and breast; blackish wings; whitish belly; salmon pink sides, flanks, and undertail coverts. Salmon pink wing linings and reddish axillaries show in flight. 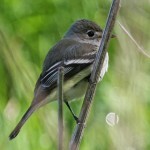 Juveniles are paler overall with a much shorter tail. Behavior: Will aggressively attack any large bird that invades its nest area. Males perform up and down, zig-zag displays. Habitat: Found in open to semiopen habitats with scattered trees or other elevated sites for perching, and in woodlands with edges or openings for foraging. 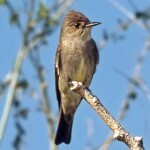 Nests in isolated trees or tall structures rather than in dense cover. 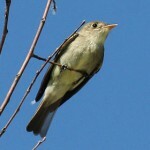 Where in Nebraska: Rare spring and fall migrant and summer resident in southern Nebraska. Vagrants seen elsewhere in the state. 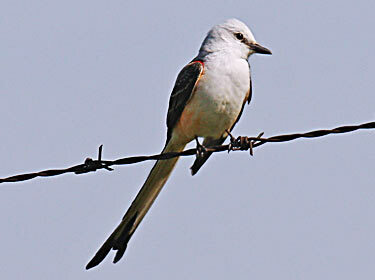 Fun Facts: The Scissor-tailed Flycatcher uses many man-made or artificial objects to build its nest including cigerette butts, paper, cloth, carpet fibers sometimes accounting for 30% of the nest’s weight.